The US-backed Turkish-led in co-op with Opposition Forces operation in northern Syria has been silently accepted by both Damascus and its allies. While the reason behind it could be evidently the fear of the YPG gaining too much ground in northern Syrian, we’re a de-facto Rojava Federation project has been already put on active; it also raises eyebrows, that Damascus is in fact tolerant of an FSA influence extension in the north, with Jarabulus and Manbij falling under their protectorate? Remember Turkey’s post-Coup normalization of relations with Syria, Russian and Iran that spooked the Opposition Rebels? Well, keep that in mind, it might come into play in no-time. Transylvania Intelligence has a hypothesis on this subject. The situation in southern Aleppo, “BEFORE” the Idlib-based Rebels offensive, and “AFTER” – reopening the supply line towards the FSA trapped in the east. In order to do that, they need Kurdish cooperation. The Kurds are holding their own neighborhoods in center-north of Aleppo. They’ve also been de-facto aligned with the Regime in this fight inside the city; but elsewhere in the country, a strange thing happened that could have a tactical impact in Aleppo City. In north-eastern Syria, in Hasakah Governorate, and in the city with the same name, some small-to-medium numbers of Regime soldiers are controlling Arab districts and are coordinating recently formed local Sunni forces. But surrounded they are by a “yellow sea” of friendly (?) YPG control. Moreover, in the same area, the US has air bases which they use for close air support, besides having Special Operators on the ground. On August 18th, the Syrian air force bombed Kurdish positions in the region for the first time in five years, marking one of the few altercations between Regime and Kurds. The bigger problem was that Damascus has bombed very close to US Special Forces operating in the area, which alarmed Washington. The White House has advanced a very clear message to Al-Assad; that the US will down any potential hostile air incursions over their troops and partners. While Washington rejects the use of the “no-fly zone” terminology, it sounds fairly similar to it. Although a Kurdish-Regime cease fire has been signed, more tensions are expected to rise. Now back in Jarabulus and Aleppo. Reports have indicated that large numbers of FSA fighters have been transported from Aleppo City to Jarabulus to participate in the operation. We might have vaguely evaluated that FSA numbers crashed after the Russia intervention in the war, many killed, many defected to the Idlib-based groups, but the lack of enough strength to fight on these fronts could indicate a more alarming situation. Moreover, the FSA with Turkish cross-border artillery fire have liberated Al-Rai recently. But as today, a snap ISIS counter-offensive retook the city. It could be potentially considered that the FSA again allocated troops from another front, Al-Rai in this case, to contribute to Operation Euphrates Shield. Luckily, the FSA quickly recovered Al-Rai and its border crossing to Turkey. Going back, this time to Damascus: Assad has tolerated the Turkish incursion to the north, with a clear reason; the fear of YPG’s rising power, land grab in the cantons, and their political project of Rojava Federation. But what did the Turks gave back? Unusual activities have been observed in Aleppo’s southern front. The Rebels have ceased to open the supply corridor gap more, while the Regime is steadying its advancing of re-closing the supply corridor, while even pouring reinforcements from Damascus. Daraya, a Damascus suburb has been under a heavy 4-year Regime siege, that involed hunger, lack of medical access and even the use of napalm bombs that destroyed the only hospital available to 8,000 people. But now the Rebels have agreed to surrender and evacuate to Idlib, under a deal with Assad’s forces. The security of Damascus is imperative for Assad and for keeping its forces loyal. Families of officers live there, and are strictly guarded by Army soldiers; their protection is a major factor influencing a commander or high ranking officer’s loyalty to the Regime. 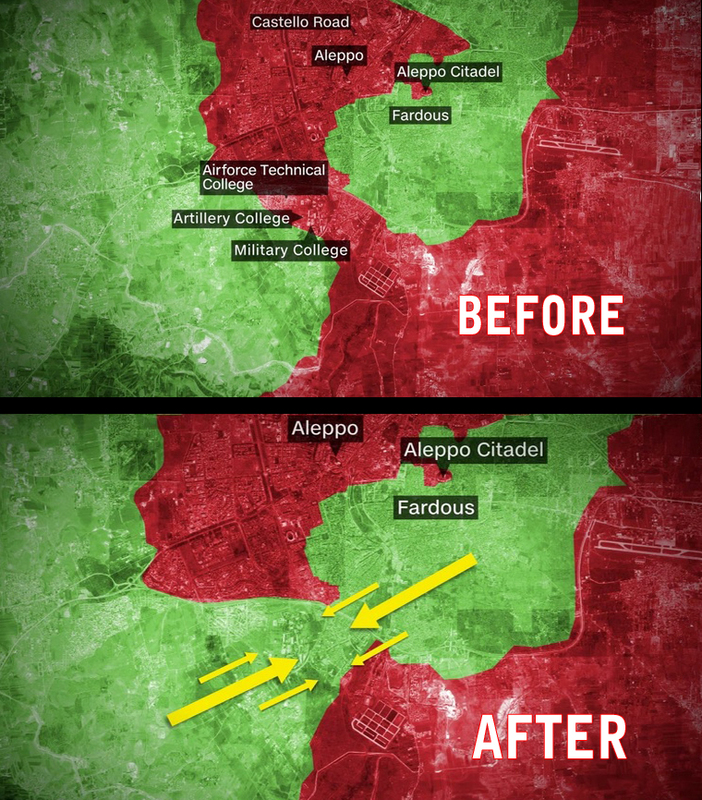 As for Aleppo… A win there would employ a major, maybe, decisive hit in the Regime’s fight against the Opposition. And for now, Assad may accept a northern Syria under Turkish-FSA protectorate which (they now think) could be negotiated; than a Kurdish breakaway region, if Aleppo is surrendered to them. Assad’s bombing of Kurds in Hasakah and its naming of YPG forces in the north as being PKK terrorists – which himself supported for decades in their insurgency against Turkey – could be considered as big signs of Assad’s pivot against Kurds and towards a more realist Turkey. But this theory is clashing with Turkey’s possible ambitious strategy in northern Syria: the buffer zone. A territory stretching from the Euphrates to the west, including Manbij, Al-Rai, Al-Bab, that would deter Kurdish advancements, denying the unification of the cantons, protect the border from Da’esh, and would also offer the FSA a constant supply corridor from Turkey. 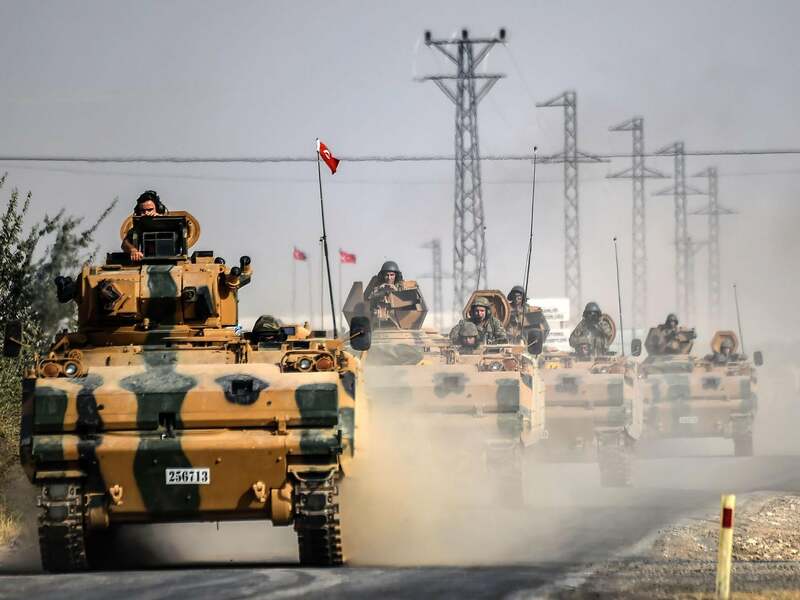 A theory could be that the Turks could hold-on to that buffer zone, mostly to deny Kurdish endeavors, until Assad’s forces can advance north and secure it, under the guarantee that Damascus would not, later on, allow or support Kurdish activities there. In-depth, it could be a pragmatic move to weaken the overall Kurdish insurgency. For many years, and especially at PKK’s peak, their struggle was enforced, supported and aided by Damascus; Syria was the only left decisive external-backer for the Kurds. Turkey has political support and leverage in Erbil, from the Kurdistan Regional Government in Iraq. Led by the Barzani family; KRG’s military group, the Pashmerga, even hosts a Turkish base and has a de jure tensioned relation with PKK. The same PKK that helped found the PYD in Syria, of which military wing is YPG. While the PKK has indeed it’s HQ in the Qandil mountains near the Iranian border, the Iraqi Kurdistan Regional Government allows Turkey’s jets to bomb and conduct recon over its territory. There is a military cooperation relation that indeed is based on an economical partnership heavily dependent on oil trade. The KRG also knows that its existence is also dependent on having a good relation with Ankara, preferring a more pragmatic and diplomatic approach towards the Kurdish cause, than a radical one as the PKK. When thinking a rational security prioritization, for Turkey is the Kurds. An alleged independence started from Rojava would indeed threaten Turkey’s territorial integrity and could push that State in a civil war. Ankara could enforce such a pivot with Assad, agreeing to his Regime if he agrees of not helping the Kurds anymore and denying their aspirations in Rojava. Such a move was prepared by Turkey’s post-Coup diplomatic normalization process with Syria, Russia, Israel and Iran. While the US could play along with the Turks in order to recover it’s damaged post-Coup relations, there are actually a lot of signals that the US and Russia are close to a agreement on Syria even if “narrow issues” still exist, after both countries had a Middle Eastern diplomatic tour; a US-Russia agreement would be the cherry on top of this whole hypothesis. Be advised: this text is a foresight prospective analysis, it does not reflect an asserted reality or a guaranteed development. It reflects a personal reflection based on facts, tendencies showed in recent developments, geopolitical context and of course, own empirical notes. “Kurds Could ‘lose US Support If They Don’t Retreat,’ Says Biden – Al Arabiya English.” http://english.alarabiya.net/en/News/middle-east/2016/08/24/Kurds-could-lose-support-if-they-don-t-retreat-says-Biden.html. “Syrian Kurds Declare New Federation in Bid for Recognition.” Middle East Eye. http://www.middleeasteye.net/news/kurdish-pyd-declares-federalism-northern-syria-1311505605. Shaheen, Kareem, and Martin Chulov. “Syrian Rebels Stunned as Turkey Signals Normalisation of Damascus Relations.” The Guardian, July 13, 2016, sec. World news. https://www.theguardian.com/world/2016/jul/13/turkey-pm-greatest-goal-is-to-improve-relations-with-syria-and-iraq. “U.S. Builds Two Air Bases in Kurdish-Controlled North Syria: Kurdish Report.” Reuters, http://www.reuters.com/article/us-mideast-crisis-syria-usa-base-idUSKCN0W80R7. “Syrian Planes Said to Bomb Kurdish-Held Area for First Time.” Reuters, http://www.reuters.com/article/us-mideast-crisis-syria-hasaka-idUSKCN10T11T. Tomson, Chris. 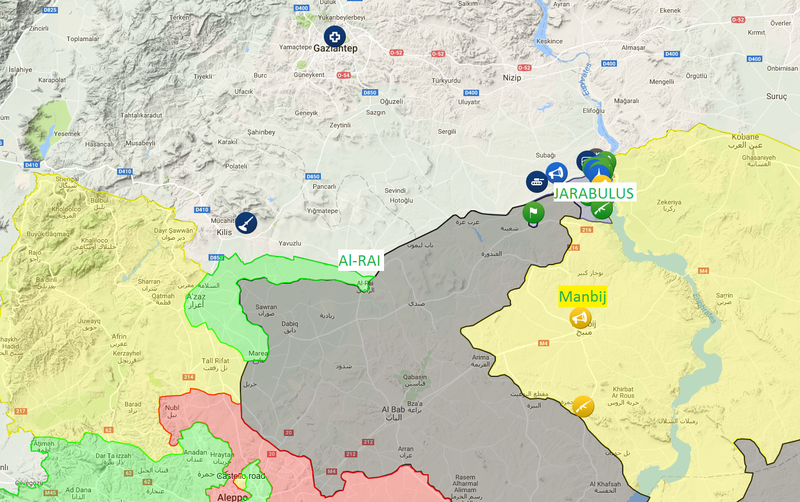 “Turkish Army Shells ISIS Border Town to Assist Rebel Forces in Northern Aleppo.” AMN – Al-Masdar News | المصدر نيوز, July 3, 2016. https://www.almasdarnews.com/article/turkish-army-shells-isis-border-town-assist-rebel-forces-northern-aleppo/. “Syria Conflict: IS Retakes Northern Town of Al-Rai from Rebels – BBC News.” http://www.bbc.com/news/world-middle-east-36014027. Fadel, Leith. “[Video] Massive Syrian Army Reinforcements Pour in Aleppo.” AMN – Al-Masdar News | المصدر نيوز, https://www.almasdarnews.com/article/video-massive-syrian-army-reinforcements-pour-aleppo/. “Syria’s Civil War: ‘Last Hospital in Daraya Bombed.’” http://www.aljazeera.com/news/2016/08/syria-civil-war-daraya-hospital-bombed-160819101838839.html. Samaan, Raf Sanchez; Josie Ensor; Magdy. “Daraya Surrenders to Assad Regime after Four Years of Siege and Starvation.” The Telegraph, 16:54. http://www.telegraph.co.uk/news/2016/08/26/daraya-surrenders-to-assad-regime-after-four-years-of-siege-and/. “Syrian Army Blames ‘military Wing of PKK’ for Hasakah Clashes.” ARA News, http://aranews.net/2016/08/syrian-army-blames-military-wing-pkk-hasakah-clashes/. “Unwelcome Guests: The Turkish Military Bases in Northern Iraq.” The Jamestown Foundation. http://www.jamestown.org/single/?no_cache=1&tx_ttnews%5Btt_news%5D=4807. “MIDEAST – PKK-KRG Tensions Rise after Fresh War of Words.” http://www.hurriyetdailynews.com/pkk-krg-tensions-rise–after-fresh-war-of-words.aspx?pageID=238&nID=81224&NewsCatID=352. “Iraqi Kurds Boost Oil Exports to Turkey.” OilPrice.com. http://oilprice.com/Latest-Energy-News/World-News/Iraqi-Kurds-Boost-Oil-Exports-to-Turkey.html. “Syrian War: US and Russia ‘Achieve Clarity on Path Forward.’” BBC News, sec. Middle East. http://www.bbc.com/news/world-middle-east-37202043.